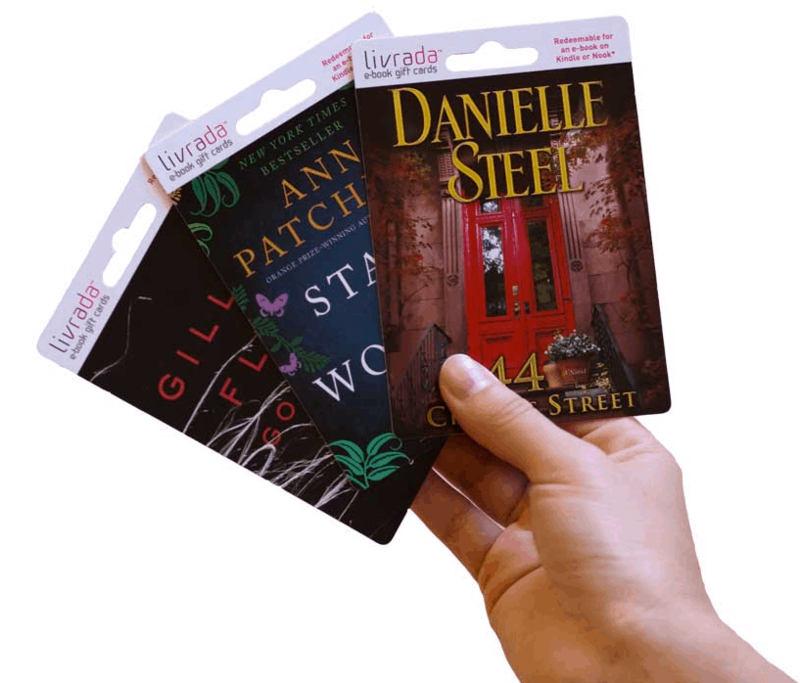 Calif-based Livrada announced today that they have raised another round of funding and are embarking on a new way to sell ebook gift cards. Livrada had previous gotten press attention last year for their ambitious plan to bring ebook gift cards to retail stores. It now appears that that idea has been sidelined in favor of a new plan: selling the eBook Gift Cards directly to authors and publishers. Livrada for Authors is intended to give authors a new way to promote their ebooks in the real world at conventions, fairs, and book signings. It allows authors to create custom ebook cards for their ebooks which can then be given away (or sold). The ebook gift cards can then be activated on the Livrada website and then redeemed in exchange for an ebook from the Kindle, Nook, or Kobo ebookstores. You will of course need an account at the respective ebookstore. To be honest this is not that new of an idea, though it is the first time that I have seen it implemented on a commercial scale. In the past I have encountered independent efforts to create gift cards to be given away at cons. Dean Wesley Smith has been making similar cards since 2011, and I'm sure he's not the only one. His cards, which you can see at right, are much more sophisticated than the cards made by Livrada. They were conceived with the goal of not just selling the card but also enabling other activities including autographing the ebook gift card. All in all, Dean found those cards to be exceptionally valuable as a promotional tool. Livrada has already launched the new Livrada for Authors platform on their website and it is currently available for new customers to sign up. Prices start at $375 for 200 "wallet cards" the size of a business card. Livrada is also offering a larger card like the ones pictured at the beginning of the post as well as stand-alone PINs. This last option is intended for authors who might want to give away ebooks via email. This is an interesting bit of news because it suggests Livrada has pivoted to a new business model. Perhaps they weren't having much luck with the retail channel. Their website only mentions a single retailer, Fry's, as carrying the ebook gift cards. This is a marked contrast to Livrada's competition from north of the border. Kevin Franco of Enthrill told me today that his company has long offered author cards similar to the ones that Livrada now offers. 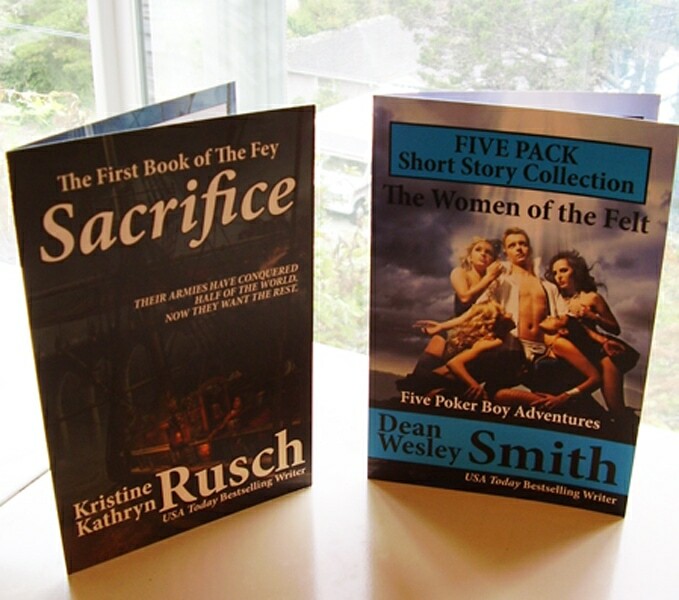 Enthrill had never made a big deal about their author cards because they were busy building up their retail distribution and getting their cards into more grocery stores, indie bookstores, and elsewhere. Bookstores are saved. They will have shelves filled with book gift cards from unknown, self-pubbed writers. Out of curiosity, when you redeem one of these cards is the book deposited in the platform’s locker? In other words, if I bought a book for my NOOK from one of these cards, is that book going to be added to my BN account (with all the wireless synching, backup, etc.) like an ebook that I bought from BN directly? Or do they just give you a downloadable file from their servers? If it’s the former – neat. If it’s the later – meh. Livrada is set up to basically give you a store credit for the ebook. Everything else is handled by the ebookstore you chose. Our cards are totally seamless! Unlike self-made cards via a coupon code on Smashwords, our cards are designed for the major e-book platforms, no side-loading needed. Thanks for your interest! We’re continuing to expand into retail as well as offering authors specialized services.